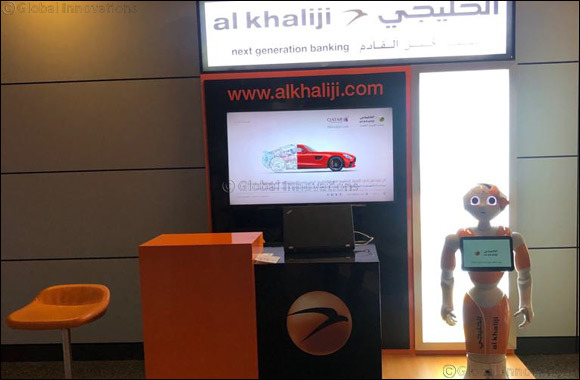 Doha, January 31, 2019 – Al Khalij Commercial Bank (al khaliji) P.Q.S.C., Qatar’s next generation bank, introduced its state-of-the-art humanoid robot to Hamad International Airport (HIA) passengers with the aim to inform the public about the bank’s latest offerings, bringing them closer to al khaliji’s innovative banking solutions. Nicknamed, Noor, the humanoid robot has been interacting with departing passengers at HIA for a period of 2 weeks, acting as an informative pit-stop station updating the public on the current services and products that the bank is offering. Noor was first introduced and launched at al khaliji’s Um Lekhba branch, in May 2018. Noor has been designed to be genuine day-to-day companion and guide. She is the first humanoid robot capable of recognizing the principal human emotions and adapting its behavior to the mood of her interlocutor. “We are excited to bring something as unique and entertaining as Noor to help further enhance the experience we offer to our customers. The introduction of Noor at the HIA departure terminal is part of al khaliji’s endeavour to consistently provide innovative banking solutions. Noor was fully capable to interact with passengers at HIA on diverse subjects ranging from banking products and services to general knowledge and fun aspects. We hope her presence served as an added value to those who had the chance to come across the information related to our offerings”. With this initiative, the bank aims to sensitize the community on the rapid advances in smart banking capabilities. It emphasizes the need to embrace such technological advances as part of the everyday banking transactions. al khaliji has always been keen to usher in innovative next generation concepts and has purposefully customized humanoid robots to deliver a very unique and personalized customer experience.